As your friends and family gather together to celebrate the season, what better way to welcome your guests into your home than with a selection of handmade La Bottega di BelGioioso cheeses? 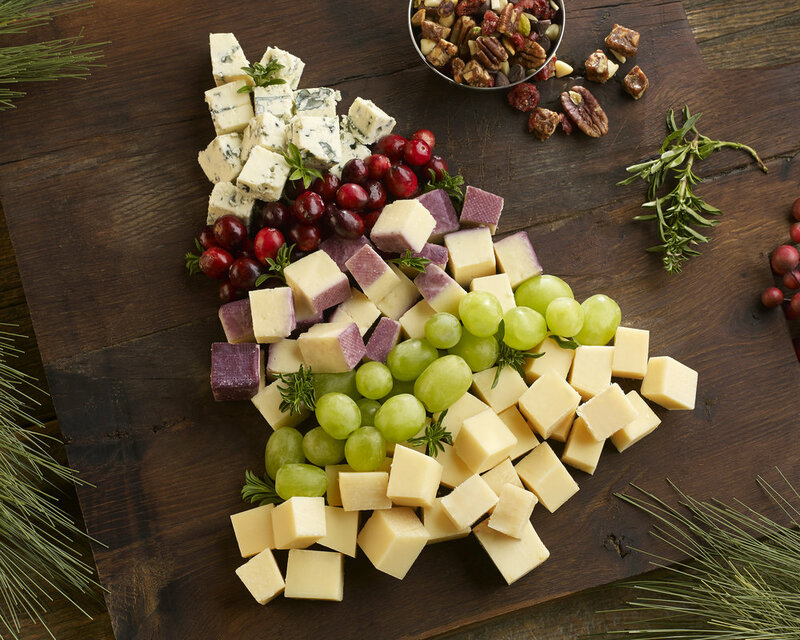 While it’s always the perfect occasion for a traditional cheese platter, the holidays give you an opportunity to present your guests with a beautiful display. These creative cheese platter presentation ideas are simple to make, yet elegant enough to be the focal point of any festive holiday gathering. This year, why not move the cheese platter from its traditional place on the side and showcase it in the center of the table where it belongs? This particular display pairs the nutty flavors of 24-month aged American Grana®, Extra Aged Parmesan, the perfect piquancy of Peperoncino®, and the earthy luxuriousness of Gorgonzola to create the perfect holiday trio. All you need is a simple cake stand to showcase your cheese platter front and center at any gathering. This arrangement that layers premium-quality La Bottega di BelGioioso cheese cubes with seasonal accompaniments is sure to be a conversation starter at your next holiday party. To assemble, alternate layers of creamy Gorgonzola, sharp Provolone Extra, and hearty Artigiano™ Vino Rosso with sweet grapes and tart, juicy cranberries. For an extra-festive look, place a few sprigs of fresh herbs around your tree for a pop of green. The addition of spiced pecans and dried fruit on the side creates a perfect balance of flavors and textures. An expressive cheese wreath is so beautifully eye-catching that your guests will quickly devour the selection of La Bottega cheeses made with locally-sourced Wisconsin milk. To make yours, simply arrange a few varieties of your favorite La Bottega di BelGioioso flavors in cubes on a round platter with nuts and dried fruit. Gorgonzola, Artigiano®Aged Balsamic & Cipolline Onion, Artigiano® Vino Rosso, and Peperoncino® make an ideal variety for every palate. Rosemary sprigs bring the wreath to life and add a fragrant aroma, while beautiful cranberries and grapes tie the classic holiday colors together. These joyous celebrations of La Bottega di BelGioioso cheese are sure to lend a sophisticated and delicious touch to your upcoming holiday gathering. For more inspiration for cheese platter presentation ideas, check out our growing selection of blog posts at savorlabottega.com/blog. Register on Facebook to win two holiday La Bottega di BelGioioso cheese boards – one for you and one for a friend! Receive our free downloadable Holiday Guide filled with recipes and entertaining ideas just for entering.